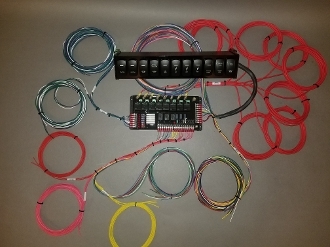 Complete wiring kit, 11 or 8 switch panel. Leash Electronics street/strip board, and a precision fab and wire universal wiring harnes designed specifally for the street/strip board. everything needed to wire a car except main battery and ground wires. New Updates feature higher current capability and hazard lights input. features: 8x 70 amp relays with heavy duty fuse sockets (one with built in optional transbrake safety for use with nitrous system), fused transbrake relay. Fused lighting outputs including high beam headlights, low beam headlights, turn signal blinkers, brake light, park light, 3 fuse batt+ outputs, 5 fused ignition voltage outputs. Board measures 9.375" x 4.5", billet aluminium base. This is like my 8 relay board, prostreet board and single stage nitrous board all in one compact unit. You can optionally select if you need any of the 8 relays to be turned on by a ground signal if needed. Any negative triggered relays will not work unless the ignition relay is on unless you specify that u need anything different. Use option box below.But specify if you need the #1 relay or #8 relay ground triggered. The #1 relay is setup as the ignition relay which also turns on the extra fused ignition power outputs. And the #8 relay is the optional nitrous relay which means it will not come on if the tranbrake if activated. The #8 relay can be used as a normal relay. You just cut a jumper to disable the transbrake interrupt feature. Also note that any negative triggered relays arm with the ignition input. This means they will only work it the ignition relay is on and a ground signal is applied to there inputs.